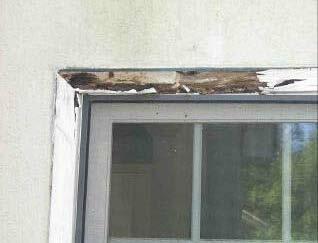 Wood windows present the most significant remediation problems. Double-hung wood windows are common in EIFS homes and fail at the highest rate of any type of window. The average EIFS-clad home in the United States has 31 window units. High moisture readings associated with windows occur in fewer than 1 of every 8 window units on average. Mullions between two ganged windows are often poorly sealed. Breaches at the top of the mullion can allow moisture entry which drains to the wall cavity below. Head flashing designed to protect the top of the window and direct water away from the window is often missing. Barrier EIFS doesn’t require head flashing since there is no drain plane for the water to exit from behind the EIFS. 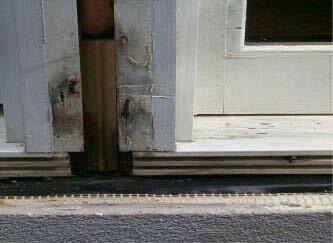 However, a drip edge can help shed water from the upper window trim. Nearly all residential EIFS was installed without the use of manufacturer-recommended backer rod joints. This problem was compounded by the lack of even a fillet joint. 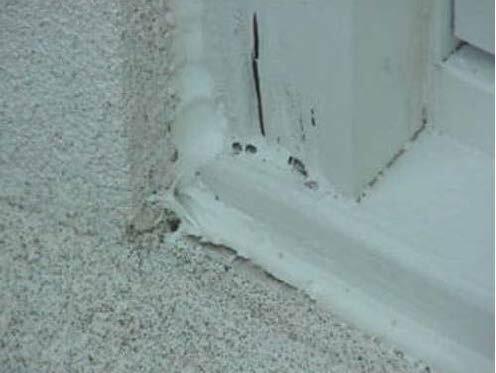 Improper joint design and caulking material has contributed significantly to remediation failures. 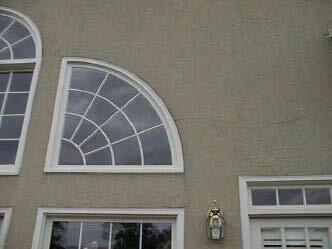 The glazing used to seal the glass to the window frame elements often fails in oversized, custom built windows, which are common to EIFS homes. Leaks at the glass pane often drain through the window construction and into the framing elements or wall cavity.